AzhwAr says that since emperumAn carries out impossible deeds, all the people in the world, without engaging with any other activity, should attain him. AzhwAr says that this physical body has to get destroyed one day. Until it falls, worship thirumAl (the consort of SrI mahAlakshmi] with garland containing flowers having beautiful petals or with rituals or with deeds. Until you have the capability, recite hymn or his divine names. 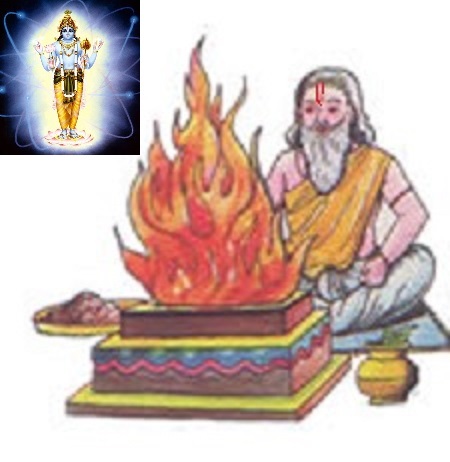 nAmaththAl – since vEdhas have ordained specific place, time, the qualified person etc for reciting divine names, one should recite emperumAn’s divine names . Who should be praised this way? thirumAlai – the consort of SrI mahAlakshmi who is our appropriate lord. Are there any customs and practices to recite one’s parent’s names? AzhwAr says that when pirAtti, who will magnify even small activities of jIvAthmA when he comes to offer his praises to emperumAn, is there with him, what is the hurdle for carrying this out? We shall take up the 71st pAsuram next. This entry was posted in iyaRpA, mudhal thiruvandhAdhi on August 19, 2017 by T N Krishnan.